For a few months now I have been struggling to understand the idea of the ‘Other’, i.e. the capitalised Other. Why is it that so many people write about it and make such a big thing of it? Having read around it a bit – not a lot, because, from my perspective, it’s hard to find anyone who writes about it with any clarity – I am beginning to wonder if, after all, it is a very simple idea. Basically each and every person who is not me is ‘Other’, which seems obvious, so what is the issue? As I see it, and from my reading about the French/Jewish philosopher Emmanuel Levinas (1906-1995), in whose work a dominant theme was the ‘Other’, there are three significant issues which make the ‘Other’ worthy of being capitalised. No man is an island, as John Donne said. We live in relationship with all things and all people. In an interview with Rebel Wisdom Iain McGilchrist says: ‘There is no way in which I exist independently of all of you and all of the planet and of all of the people who came before me, and indeed in a strange way I am part of something that is to come. That is all not in me or in them or in some sort of gaps between us but is in the betweenness’. This is a significant idea because it means not only that we live in relation to all other people, but that our self cannot come into being without the ‘Other’, or as Gary Goldberg wrote in a comment on a previous post (‘Attending to the Invisible Other’), ‘Being for the Other precedes Being for oneself’. Our identity depends on being in relation to the ‘Other’. This raises the second issue, that of responsibility for the ‘Other’. I am always and always have been in relation to the Other – meaning the other person. The presence of the Other calls me to service and responsibility. The Other brings myself into being, through my separation from the Other. The face of the Other, makes it clear that ‘I am not everything – that everything does not belong to me and that my consciousness does not encompass everything’. Everything also belongs to the Other. We might ignore, but cannot escape our responsibility for the ‘Other’. But what does this mean in practice? I have just spent a month in India, where it was hard not to recognise the ‘Other’ and consider what my responsibility for the ‘Other’ is. 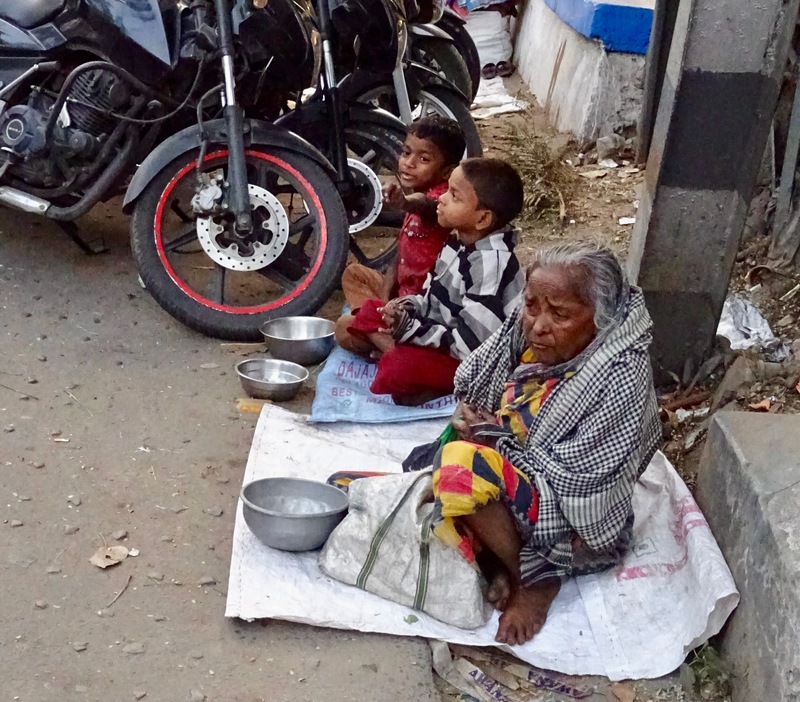 Should I, or should I not give money to this family of beggars I saw on the streets? Would that fulfil my responsibility to them? And why do we tend to focus on ‘Others’ who are extremely different to us, when our immediate neighbour is also ‘Other’? How do I prioritise my responsibility? Should I prioritise responsibility? And what forms should my responsibility take? These are the sorts of questions that consideration of Levinas’ idea of responsibility for the ‘Other’ have raised for me. This leads to the third issue. How can the ‘Other’ enter into ‘my’ world without simply being reduced to that world? I interpret this to mean, how do I see myself in relation to others as opposed to over and above others, and how do I maintain and respect difference? On thinking about this, I realise that we probably try and dominate the ‘Other’, in the sense of hoping for a degree of sameness, more than we think we do. If you have children, think of the number of times you might have wished that your child will be like you, at least in your values. Or if we find ourselves in a different culture, how often do we look for and value ‘sameness’, for example, being able to laugh at the same things? How comfortable do we really feel with difference? How easy do we find it to fully embrace and respect difference, without trying to mould it into sameness? Another common denial of the ‘Other’s’ difference is when we limit the ‘Other’ to a category, e.g. race, gender, age etc. In this sense the ‘Other’ is dominated and controlled by the same, which is what Levinas was warning against. I have found myself wondering why Levinas’ thinking about the ‘Other’ and ‘Otherness’ continues to hold people’s attention. I have come to the conclusion that it is not so much whether or not we recognise that the ‘Other’ exists. In fact I can’t see how anyone could be unaware of the ‘Other’. Every person is a unique individual, different to every other person, so every human encounter is with the ‘Other’. It’s more about how we respond to the ‘Other’. Do we try and dominate the ‘Other’? Do we accept responsibility for the ‘Other’? Do we try to listen and learn from the ‘Other’? Levinas invites us to listen to the voice of the ‘Other’. This, he believes, is our moral and ethical responsibility. Beavers, A. (1990). Introducing Levinas to undergraduate philosophers. Colloquy Paper, Undergraduate Philosophy Association, 1–8. Buddeberg, E. (2018). Thinking the other, thinking otherwise: Levinas’ conception of responsibility binnen de muren van een verpleegtehuis voor ouderen. Interdisciplinary Science Reviews, 43(2), 146–155. Kader Düşgün, C. (2017). The Self and the Other in the Philosophy of Levinas. Mediterranean Journal of Humanities, 7(2), 243–250. Nooteboom, B., Levinas, E., Levinas, F., & Bellow, S. (2012). Levinas, 1–8. Walicki, M. (1996). Levinas for the Beginners, 1–9. Young, B. (1995). An Introduction to Levinas.